Question: Vladimir Nikolayevich, will you tell our readers a little bit about the children. What are they doing and what are their plans for the future? Vladimir Megre: I think they are developing very quickly. I cannot answer with certainty, what tasks and challenges they will face. Life itself must show that. I don’t even know about my own future. Of course I wish only the best for them. Question: What do the children do in their daily lives? Vladimir Megre: It is not easy to describe their life with a few words. Let me say it in this way: They learn to think. The major task for human beings consists of learning how to think. We have forgotten how to think, this is a problem of all of humankind. We use the majority of our life energy to provide for food and shelter. However, one really does not need to think about this much. We forget that the earth has provided for all our needs since primeval times. What is more important is to recognize the true nature of the earth and which forces are at work on our home planet. Instead of spending so much effort to ensure our survival, we should dream more and be creative. We should create similar worlds such as ours on other planets. I believe mankind will concern itself with these questions as soon as it recognizes its own purpose. Question: Many of us still want to know how little Vladimir experienced the birth of his baby sister. Vladimir Megre: He dreamed about it for a long time, and looked forward to her arrival very much. By now, naturally, it also happens occasionally that he is irritable with her, but that is completely normal because of their age difference. Their thoughtful, curious eyes are expressions of their desire to understand the world and its people. They have a very attentive relationship with adults. Question: Does Volodya tell you about his newest discoveries? Vladimir Megre: He is constantly busy expanding his discoveries about the world surrounding him and of the entire cosmos. “Discoveries” is actually not the right expression; rather, he is sharpening his understanding of the world and its true laws. When he was younger he would imagine that he was located in the control center of a spaceship – a spaceship, which did not consist of metal or other artificial materials, but of living matter, and in which everything was created for humans and at their disposal. Childhood is given to us so we can recognize and learn all this. And that’s exactly what he is doing. This process is alien to many of our children because of the influence of the technocratic world. Modern people spend their entire life with the study of the technocratic world. Telephones, computers and cars, however, are nothing more than prostheses. All our lives, we learn to use these prostheses and use the power of our thoughts to create better and better prostheses. That is very unfortunate. Question: How do Anastasia and the children spend the winter? Vladimir Megre: In the winter the children sleep much more, and because they were born and live in that environment, they are well adapted to the icy winters. There are even people which were not born in such a rough climate but who are nevertheless not bothered by these low temperatures. I know a few people in Saint Petersburg who wear nothing but a short-sleeved shirt over their skin in the winter. Anastasia runs around barefoot without problems, and sometimes she wears a type of footwear like the Bedouins. In the film “Family homestead” the Molchanowych family is shown, and one sees how their small child runs barefoot through the snow. They even say that clothes are unpleasant to him and that he can bathe in ice water. This is, to be sure, about a child which is just learning to toughen up. The same is naturally all the more true for Anastasia and her children. They do not need to wrap themselves up, because they are living in their natural environment. I assume that it has also to do with their genes. I observe the cats with great interest here in Egypt. They have a very similar coat to the Siberian cats, only here they can tolerate plus 40 °C (104 F), as opposed to minus 40 degrees in Siberia – a difference of 80 degrees (in Celsius). What absolutely perfect adaptation! Human beings have been equipped with such powers since primordial times, but in our technological environment we lose those abilities, since they remain unused. Since humans have become too complacent to adapt, they create prostheses for themselves: air conditioning systems, heating elements and new types of clothing materials. The hunters in the Taiga carry only a padded jacket and a turtleneck sweater; they do not need a fur, since they constantly move. Also, their inner feeling-world is much more intense than ours. Someone who comes out of a Russian bath into the cold snow, actually enjoys the icy cold for quite awhile. While we are talking here about an artificial increase of temperature, the same can be effected in natural ways. Humans have their own protective mechanisms which can increase body temperature. This is expressed, for example, in the form of a fever. For now, however, let’s agree with the statement that by this mechanism the temperature is held at 36.6 °C (97.9 F). Anastasia moves around even more in ice-cold weather, not physically, but rather internally, in order to utilize her body’s own thermal capacity. Question: And what do they do during the long winter evenings? Question: There are many letters, in which readers ask Anastasia to heal relatives or children. Can you speak to those requests? Vladimir Megre: I have responded to these requests repeatedly and have also written about these issues. Anastasia does not treat acute diseases. She could heal me as well, but does not do that either. Illness is a conversation between man and God. It is a false concept that a doctor or some medication can heal an illness. In reality humans can heal every one of their diseases themselves, exactly the same way they did cause them themselves. But for this it is necessary to understand the underlying causes of an illness. We must learn to develop our own consciousness. Even serious diseases such as cancer are there for us to learn from. At least that is Anastasia’s opinion, and I cannot argue with that. I have asked her off and on to treat certain conditions, but she refuses, since she regards such healing as an interference. Perhaps it is God whom a sick person really needs. And maybe we become ill because we do not live in divine nature, but in a stony prison. Question: Do you still experience communication difficulties between you and your children, or have you found a better way to connect with them? Vladimir Megre: Indeed, I still have not found a more satisfying way to communicate with them and have also found no educational method to bring to them. But I am very pleased with their behavior – so much so that I hope to learn from their example too. Momentarily, I make no contribution to their education. Perhaps it is also simply true that I am committed to use my time to write books. Question: Vladimir Nikolayevich, can you comment on the Family homestead movement: What is your opinion about the main problem with its development? Why doesn’t everything proceed more quickly, the way one might want to see it happen? Vladimir Megre: First of all I do not have the impression that this movement is developing slowly. Secondly modern humans are obviously not ready, without preparation upon the land, so as to assure an ideal settlement. In Russia there are already some people, those, who have developed a plan, and designed a settlement on the land. I do not know how many there are, but expect many more in the future. It is important for their successors to be able to learn from their errors. If you did everything at once, the possibility for errors would surely be much larger. Everyone knows for example that the ground must be first enriched and that one should not cultivate anything in the first two, three years except certain plants, which fertilize the ground. Others do not consider where groundwater is to be found, or they make errors with the construction of houses. Presently, such errors are still pervasive. I trust that we are altogether on the correct path, and one can see a tendency toward an intensification of the family homestead movement. And that is the main thing. Question: Anastasia’s grandfather said to you that you should create a political party. Why have you not pursued anything in that regard? Vladimir Megre: First of all I do not hold myself out to be able to lead people in that kind of way. Secondly I could not write my books at the same time and also develop a film script for the world. And thirdly: If I would organize a party, then people would simply watch and listen, without really becoming active with anything. It’s much better if there is a group of people which does not even need to be registered, which does go out, however, from the heart of humans. If it should be nevertheless registered, then I will join it as a simple member. My resolution has been certain for a long time, namely that I never want to be a political party leader. 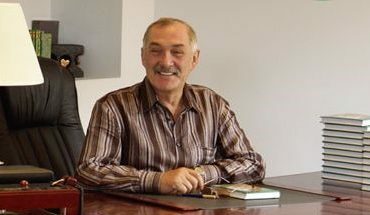 Question: Vladimir Nikolayevich, people often ask why you decided to publish the current volumes in three parts? Vladimir Megre: Because the topic required it. I found it necessary to write about the subject matter in more detail, namely the concept of a new human civilization – and about human civilization in general. In that way, I could organize it better. Because it is such an important subject matter, I decided to expand this topic in several different ways. Sometimes it even seems as if I deviate from the topic. For example, many readers might ask themselves: Why all these rituals? Rituals are, however, very important. In the past, humans learned to evolve by way of rituals; to improve their well-being, or to pass on information from one generation to the next. But these rituals were suddenly abolished. Otherwise we might already be very close to the ultimate human perfection. But what do we have now in their place? Nothing at all other than platitudes and naive tales, such as, for example, the journey to the “eternal fire”. What information can one get from that? And if one considers the rituals more carefully, then one finds out that in each action, in each motion, powerful information is contained which has a positive effect on the psyche of the whole person – and of a whole people. Therefore I had to deal with the issue of rituals at length, in order to make a selection possible of the best rituals of different epochs, with whose assistance the new civilization can be created.